The TeSelle Family website is completely bilingual between English and Dutch. 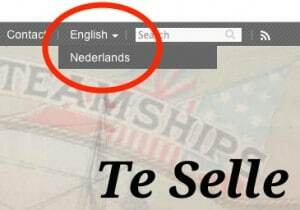 A drop-down box near the upper right corner of every page allows the reader to easily switch between English and Dutch. Simply click the alternate language on any page and you will go directly to the same page in the other language. Over the years Te Selle family members have become more aware of their family roots and the connections between family members in the Netherlands and the United States. This TeSelle Family website seeks to enhance and facilitate the exchange of family history among various family members. An important aspect of the Te Selle family’s history is the history of the two countries — the Netherlands and the United States — how the economy, culture, politics, religion, education, and opportunities were determining the course of events for huge numbers of people, not just the TeSelle family. What was life like in Winterswijk, Netherlands for the early te Selle family members? Why did some family members stay in the Netherlands, while others braved uncertainty and hardship to emigrate to the United States? Why did the American immigrants disperse to various settlements in places like Wisconsin, Nebraska, Washington, Colorado, Iowa, Montana, Kansas, and others? In addition to historical events, we also wanted to highlight individual Te Selle family ancestors — where they lived, how they lived, what they accomplished, what legacy they left. At some point in each person’s life there seems to be a desire to look back at his or her ancestral history to get a tiny glimpse of why we are who we are. We wanted the Te Selle Family website to provide that glimpse of family history to whoever might be interested. The primary content of the Te Selle Family website is divided into several major sections, which can be reached by clicking one of the links along the Main Navigation Bar just below the header section on every page. Within each major section there are numerous subsections, which can be opened by using the drop-down links under each of the major section links. Each major section is described briefly below. The Home page is a portal to the entire website. In the header and navigation bar are links to all the website content. If you know where you want to go, you can get there quickly with these links. In the middle section are three brief excerpts from some interesting stories within the site. In the footer section are additional excerpts and links to get you started on your visit to the TeSelle Family website. The What’s New section contains chronological blog entries and links to highlight new and interesting content in the website. The Winterswijk section describes the geography, economy, culture, politics, and education in the Winterswijk area primarily during the 1800’s when the te Selle family was evolving and some family members were emigrating from Winterswijk to the United States. This section also explores the origin of the “te Selle” name and the tradition of Dutch name-giving. The section on America explores the reasons why Dutch immigrants in general, and the Te Selle family in particular, came to America in the 1800’s. Through various letters, stories, and memorabilia we learn how various branches of the Te Selle family, once they arrived in America, then dispersed geographically to states like Wisconsin, Nebraska, Kansas, Iowa, Washington, Montana, Colorado, and others. For certain family members we have gathered enough stories, images, documents, and other memorabilia to create individual profiles of those people. By reading these profiles and following the links to other documents, you will begin to get a picture of what each of these people was like, and how they contributed to the evolution of the TeSelle Family. We hope you enjoy getting to know your family a little bit better! The References section describes the various source materials used in this website, and also provides links to various web resources that may be useful and informative for the website user. Finally, the Gallery is a repository for all the various images we have accumulated in the Te Selle Family website. The introduction to the Genealogy section gives some background information about the name “te Selle”. There is also a link to our specific “Te Selle Genealogy”, where you can trace your ancestors back to the original ancestor named “te Selle”. A Contact Form is available for you to comment or inquire about the website, and for you to submit your own stories, documents, and images that you would like to contribute to the Te Selle Family website. The Language Switcher link switches between the English and Dutch version of each website page. The Search box allows the user to quickly find any references to a particular person, place, or other item of interest. Enjoy your visit to the Te Selle Family website. Please use our Contact Form to send us your feedback. We welcome you comments, questions, and your contribution of stories and memorabilia that might enhance the Te Selle Family history for the benefit of other family members.